My good friend B took me to some of his hangout spots last night and I hope to check them out again. We first hit happy hour at Crowbar, which is across the street from popular Italian hipster eatery Savio Volpe on Fraser and Kingsway. When we arrived just after 5pm when Crowbar opened, we were practically the only people there for over an hour and a half. Maybe it was a slow night after New Year's and people were back to work. 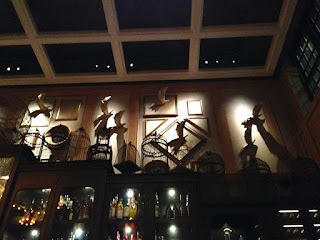 It's a hipster bar, with antique-looking glasses in wooden boxes nailed to the back wall of the bar, along with several bottles of Champagne that had been sabered, with the sabre also hanging on the wall. I don't drink much, but settled on a can of Lonetree cider (CAD$7) that was refreshing, but a lot for me to finish! B likes the cocktails here and the menu looked interesting with names like Bruce Wayne, Nicky Santoro, Mary Swanson and Keyser Soze. 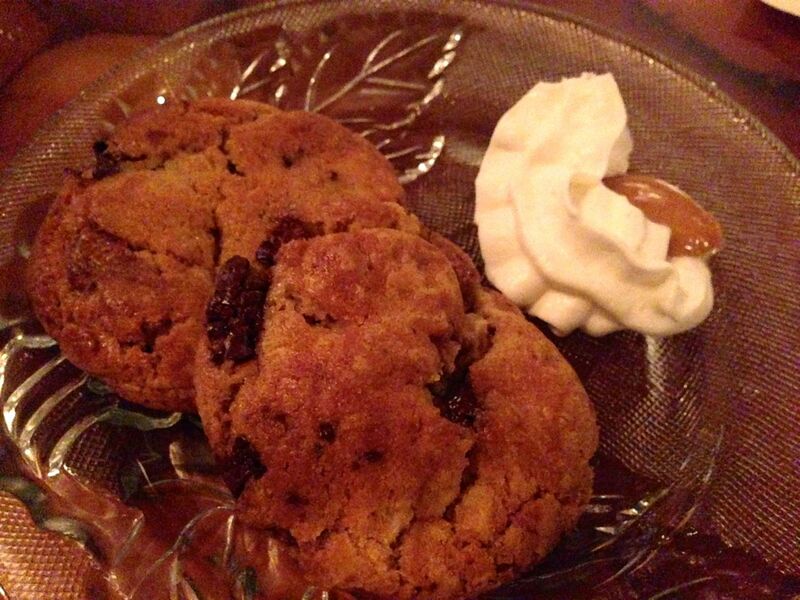 Some dishes on the happy hour menu are discounted, but we didn't choose those ones. Instead we had the beef tartare (CAD$13) with pickled shallots and celery shavings. It was a tad salty, but really enjoyed it with the pickled shallots that brightened the dish. Another winner was the dealers choice pasta (CAD$20), and in this case it was a two-toned ravioli, one side filled with duck liver parfait, the other with ricotta. Oh so good. They were very addictive. Be sure to try the salted chocolate chip cookies (CAD$7) that arrive warm and crumbly, along with chantillly cream and dulce de leche. 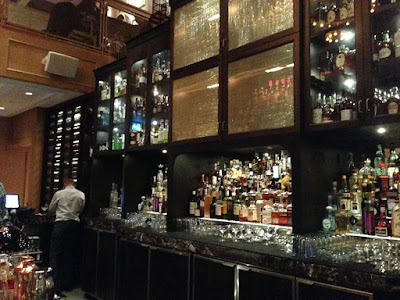 After another friend arrived, we headed downtown to Nightingale, chef/owner David Hawksworth's bar and restaurant that has opened for about a year now. Walking into the heritage building, we are immediately impressed by the high ceilings in the two-storey bar and restaurant. 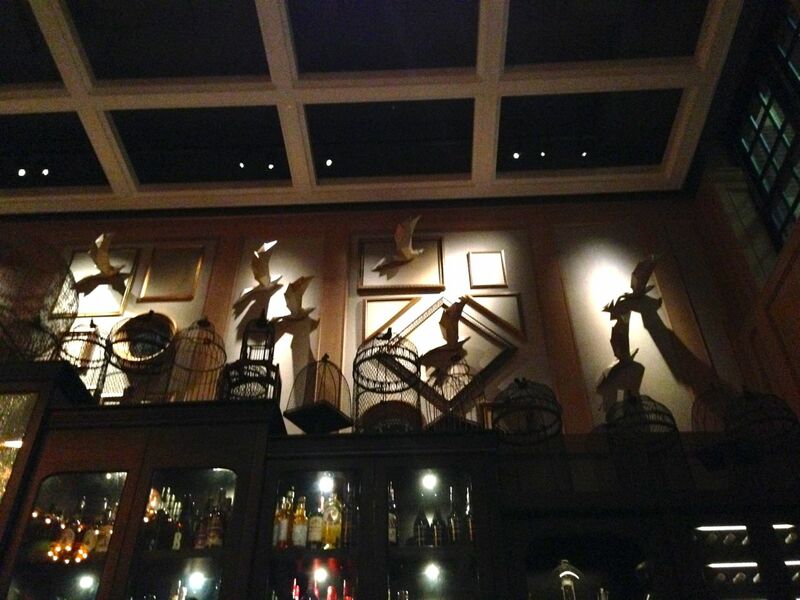 The bird theme is present above the bar, with large bird sculptures outside of empty bird cages. The bar itself looks very similar to West, just missing a ladder to get things on the top shelf, but here the bottles of wine aren't placed so high up on the shelf. We didn't make a reservation, and unlike Crowbar, the place was hopping and there were no seats at the bar at first. But not long afterwards a couple left and we were able to occupy their seats and got a few more for other friends who came by. I'd already had my alcohol quota for the evening and had a lime soda to which the bartender wasn't exactly thrilled; my friends made up for the alcohol content instead. The menu looked interesting, but I just read the review in the Globe and Mail and find that many of the items are practically the same as Gjelina in Venice Beach, California. That's disappointing to discover and so you have to wonder why a talented chef like Hawksworth has to copy someone else's menu. The two dishes I tried I enjoyed -- the burrata and anchovy toast, peperonata and parsley (CAD$16) was a gourmet version of bruschetta. 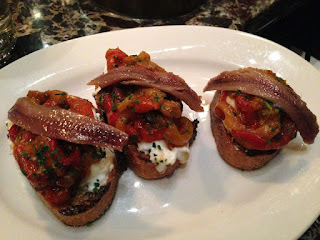 The red peppers were so sweet, they counterbalanced the saltiness of the anchovies, while the creaminess of the burrata contrasted with the crunchiness of the toasted baguette. 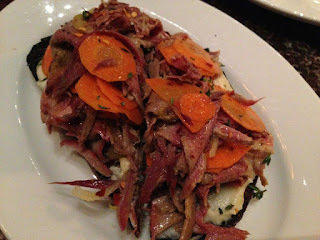 Another was shaved bison tongue, carrot escabeche, celery root on grilled bread (CAD$15). These were open-faced sandwiches that were very hearty and had a kick to them with a dash of chilli. I took a peek upstairs to see an even more extensive dining area that was dominated by a large open kitchen, chefs wearing black T-shirts and rushing to fill orders. It didn't look like there was an executive chef leading the pack, they seemed to operate on their own and didn't notice guests were watching. 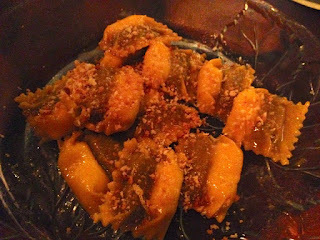 A friend also had the red wine braised prunes with mascarpone and toasted pistachio (CAD$12) for dessert that she thoroughly enjoyed, though she left most of the mascarpone on her plate. Definitely an enjoyable evening, and worth checking out again next time. I hear it's now the power lunch place in downtown Vancouver.